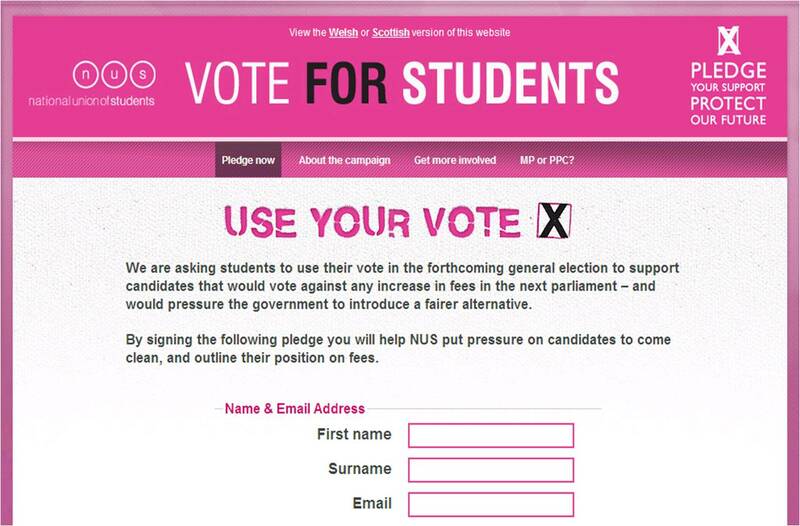 The National Union of Students have launched a campaign that seeks to harnass the student vote in this year’s general election in order to prevent candidates who support increasing university fees getting elected. It’s a clever campaign, based on the insight that no MP would like a bunch of angry student activists stirring up trouble in their constituency at a general election, which looks increasingly like it could be a close one. The NUS want MPs and prospective parliamentary candidates to fess-up as to whether they’d increase the top-up between now and the election. That way they can tie the post-election hands of those would-be-MPs who would like to court the student vote pre-election and target those who are not supportive of their cause for some serious electoral aggro. I can’t think that the NUS is very serious about getting MPs and PPCs involed in this pledge, when you click the link to http://www.nus.org.uk/en/Campaigns/Funding-Our-Future-/pledge you are just treaded to a 404.